The island of Montreal is a jungle of greenery in the summer. From late spring to early fall, Montreal is the perfect place for growing food. Every year, more and more residents are taking an interest in educating themselves on sustainable food production. Whether it’s getting weekly baskets from your local farm, having beehives and chickens in your backyard, or volunteering at an urban garden in your neighbourhood, Montrealers are progressively becoming more in tune with the ins and outs of urban farming. Non-profits like Santropol Roulant, POC, Alvéole, and the Hudson Food Collective are pioneers in innovative, sustainable urban agriculture. The price of food is rising each year, and will only continue to rise if we depend on large-scale commercial farming for the majority of our food. Incorporating locally grown produce into your grocery list is the first step towards contributing to the sustainability of our city. 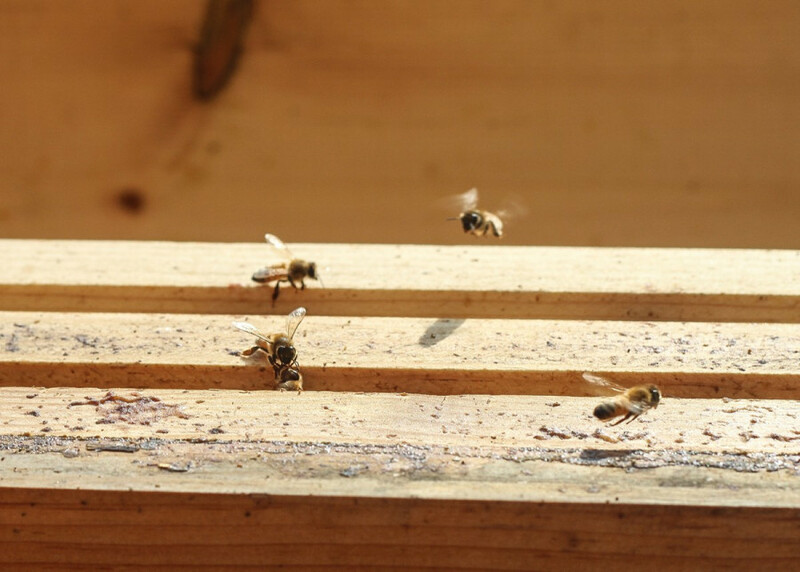 In this article, you’ll discover that you’re actually surrounded by urban beehives, and if you look over your backyard fence you might just see a few chickens. You’ll find out how you can volunteer for your local community garden, or how to directly engage in helping our seniors eat fresh produce everyday. And, if you’re really inspired, you might realize just how easy it is to buy locally grown, pesticide-free organic produce from your neighbourhood café every week. Santropol Roulant, one of Montreal’s larger urban gardening companies, was started 22 years ago by two eager young waiters who worked at Café Santropol, the beloved Montreal café located on Saint-Urbain St. Their vision was to address major societal issues found in Montreal, and improve them with sustainable food production, including urban farming and volunteer-based initiatives. According to Santropol Roulant’s Urban Agriculture Manager Marie-Anne Viau, at its core, Santropol Roulant is a meals on wheels. After 22 years of company growth, Santropol Roulant now has four urban green spaces where their produce is grown. The first is their Edible Campus located on the Burnside Plaza at McGill University. Santropol Roulant installed 300 self-watering containers to create an urban art garden, and began to grow produce for their meals on wheels campaign there in 2007. The second is a rooftop greenhouse where their office is located on Roy St. and Colonial Ave. in the Plateau Mont-Royal. Santropol Roulant bought the building seven years ago, and had it completely renovated so it could accommodate the weight of a rooftop garden. They’ve recently created an outdoor community garden in front of the building where residents of the area can learn about gardening, and pick and eat fresh produce. Now Santropol Roulant relies almost exclusively on their small farm in Senneville, Que., at the very western end of the island. In 2016, the Santropol Roulant Peri-Urban farm harvested almost 20,000 kilos of produce for their meals-on-wheels. With their small farm growing the majority of their produce, Santropol Roulant is now converting their downtown gardens into educational facilities and teaching their volunteers and community the importance of urban agriculture. “Now I’m showing a lot of people how to garden and share the harvest altogether, so it’s bringing food security for other people too,” Viau said. The pay-what-you-can, easy, and accessible vegan lunches that most Concordia students know as People’s Potato is far from a simple operation. Eseosa Idemudia, a collective member of People’s Potato who manages their kitchen portfolio, said that the Potato started feeding students out of a church basement near the downtown Concordia campus in 1999. Now the Potato feeds 300 to 400 people every regular school day during Concordia’s academic calendar. 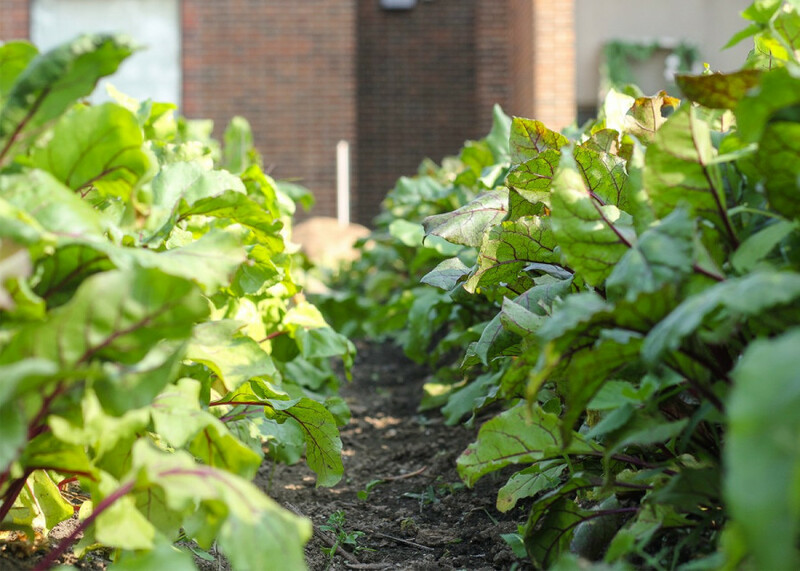 A community garden is located on Concordia’s Loyola campus and provides the Potato with the essentials that their lunches are made of, like potatoes, carrots, and tomatoes. 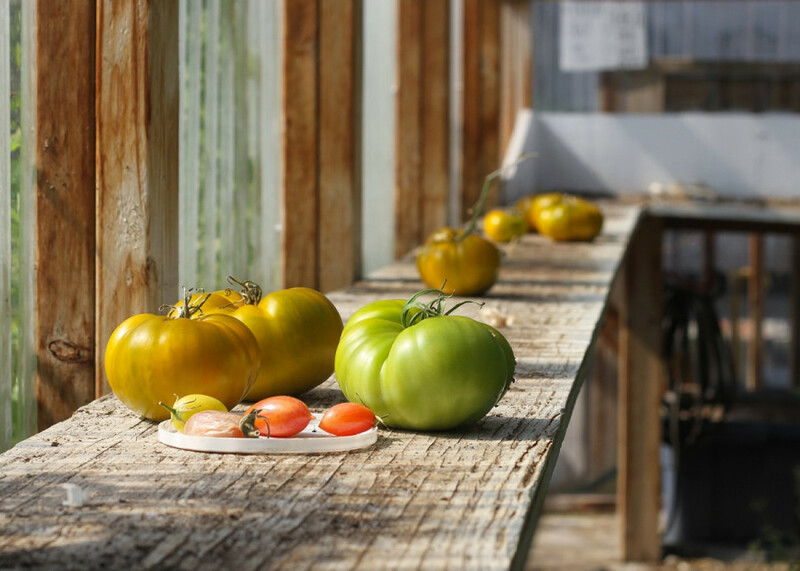 According to Idemudia, the garden was started about 14 years ago as a pilot project that led to the creation of the City Farm School, now run out of the Concordia Greenhouse. The program, which is open to both students and non-students, educates urbanites on plant knowledge, organic crop planting, food politics and sustainability. Volunteers who work in the garden throughout the summer can leave with a hefty basket of fresh produce—whatever is ready for harvest. And volunteers who make and serve the daily lunches downtown can skip the line and get a free meal. Idemudia explained that urban agriculture has become increasingly important for People’s Potato because food prices have been consistently rising since their last fee-levy increase. A fee-levy is a specified portion of student tuition collected by groups on campus, voted on by the student body. With a rise in interest in urban farming in Montreal, non-profits like POC and Alvéole are pioneers in establishing new and affordable ways for residents to engage in sustainable urban agriculture. Alvéole is Montreal’s premiere beehive provider. Started by three friends, Alexandre McLean, Étienne Lapierre, and Declan Rankin Jardin in 2012, Alvéole now has over 500 beehives all over the city. Gabrielle Caron, a beekeeper for Alvéole and past Sustainability Coordinator for the Concordia Student Union, said that the company has three types of clients: regular citizens who want hives on their balconies or rooftops, business owners, and schools. Caron explained that Alvéole beekeepers visit the beehives between one and two times a month to make sure the bees are healthy, and that they have everything they need. When the honey is ready for harvest, the beekeepers take the frames out of the hives and bring them to Alvéole headquarters, where the honey is extracted through an intricate hands-on process. POC is in its first year of creation. A sister company to Alvéole started by McLean and Lapierre, POC creates backyard chicken coops that are built to code under city regulations so clients can have fresh eggs throughout the year. Each coop comes with three young chickens that each lay one egg a day. This year POC also provided food for the chickens to last through the summer. Backyard chicken farming is only legal in the boroughs of Rosemont-La Petite-Patrie and Mercier-Hochelaga-Maisonneuve. Each neighbourhood has specific chicken coop regulations, so POC has designed their coops to satisfy these laws in both neighbourhoods. Anne Tremblay, Director of Operations at POC, said that this year the startup only had one model for their clients. This year POC had 50 clients and 150 chickens, which came from a farm just outside Montreal. The Hudson Heartbeet Community Farm was created by Loic Freeman Lavoie and Rébecca Phaneuf-Thibault with the help of the Hudson Food Collective. 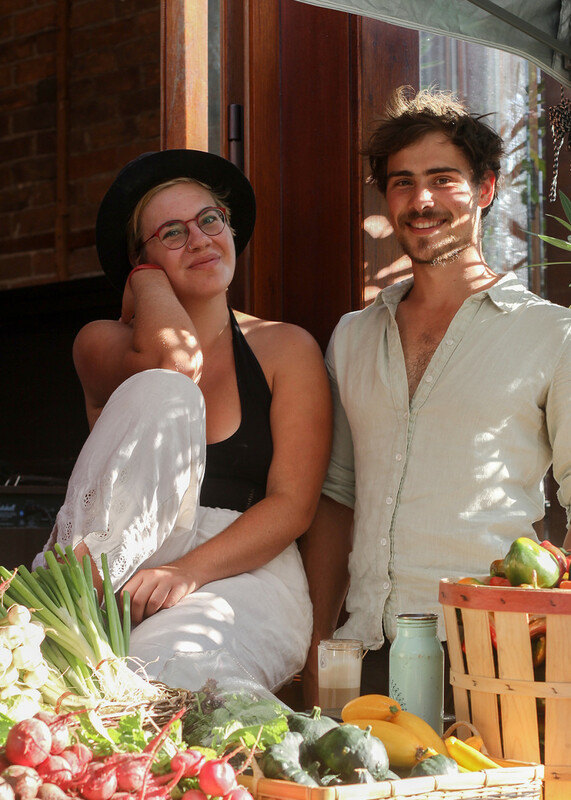 After months of planning, Freeman Lavoie, a recent Concordia graduate with a bachelor’s in urban planning, and Phaneuf-Thibault pitched their idea of starting an organic farm to the city of Hudson last summer, and were granted a two acre plot of land owned by the city. This year, Freeman Lavoie and Phaneuf-Thibault began planting seedlings that they obtained from Santropol Roulant in early April, and have been harvesting fresh organic vegetables since June. The young couple have done most of the labour themselves. Every week, they bring their produce to a farmers market in Ville St. Laurent. They also have 14 clients who have signed up for vegetable baskets in the Plateau from the Depanneur Café, and another 39 in Hudson. This year, the farm has grown 40 different vegetables with 80 different varieties, which is pretty standard for a Community Supported Agriculture organic farm, according to Freeman Lavoie. CSA, Freeman Lavoie said, was a model that was started in Japan in the 60s and 70s. “CSA farming has been the frontier of bringing back organic produce since the commercial market was uninterested in supporting organic or local, because it was a lot more convenient to have large scale farms using petrochemicals,” Freeman Lavoie said. The Hudson Heartbeet Community Farm will bring their produce to the Depanneur Café until the beginning of November. They’ll be accepting new subscriptions for weekly vegetable baskets at the Depanneur Café until then. If you’ve never worked in a garden, you should try it. It’s hard and dirty work, but there is something very human about planting a seed and watching it grow until it becomes something that can nourish you and your family. Growing your own food, or supporting your local farmers, whether they be on a rooftop or in a field, is becoming increasingly important with the direction in which our fragile environment is going towards. Bringing nature back into the city, like POC or Alvéole, is the future of sustainable agriculture. And you, too, can contribute to the wellbeing of our planet, and grow kale on your balcony.